1/2 pound asparagus spears, cooked. To make dressing, mix together mayonnaise, ketchup, relish, olives, and eggs. Make a bed of iceberg lettuce on a large plate. 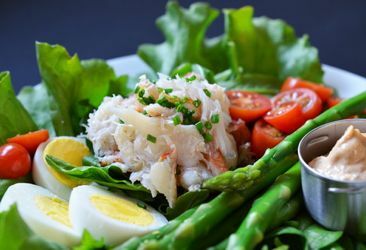 Top with crab, avocado, tomatoes, and asparagus. Drizzle with Louie dressing.